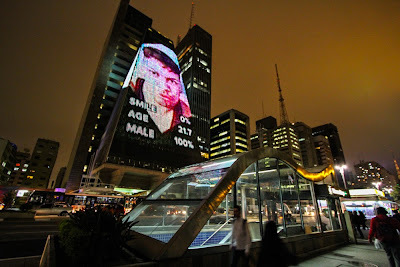 SelfieSaoPaulo facade video from Lev Manovich on Vimeo. 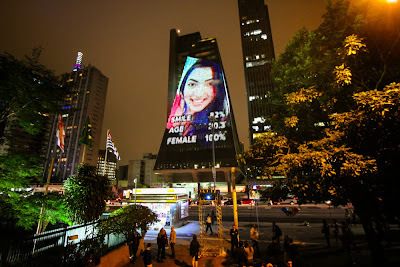 SelfieSaoPaulo is a new project by Moritz Stefaner, Jay Chow and Lev Manovich created for 2014 SP_Urban Festival. The work will run every evening for the duration of the festival: June 9 to July 7, 2014. The media facade is located at the building FIESP / SESI and Alameda das Flores (Avenida Paulista 1313). The project develops further the ideas from Selfiecity published early in 2014. Created by the larger team headed by Stefaner and Manovich, Selfiecity investigates the style of self-portraits (selfies) in five cities across the world using a mix of theoretic, artistic and quantitative methods. Presentation of the project includes high resolution visualizations showing patterns in 3200 Instagram selfie photos. Interactive Selfiexploratory allows website visitors to explore the selfies database in real-time, selecting the photos using geographic and demographic information, and face characteristics as analyzed by software. 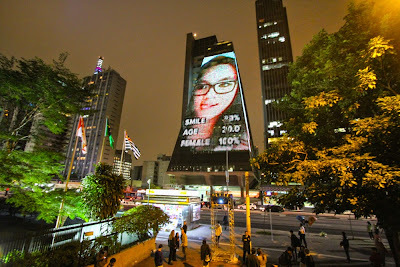 SelfieSaoPaulo is designed for the large media facade in the center of Sao Paolo. Individual Sao Paolo Instagram selfie photos are sorted by three characteristics and animated over time. 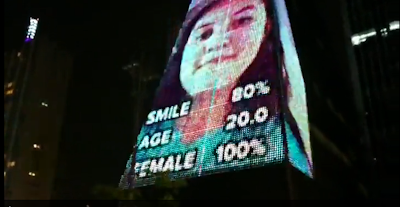 One animation presents the photos organized by estimated age, another by gender, and the third by the amount of smile. The animations show us diversity of Sao Paolo citizens, and the variety of ways in which they present their self-portraits, including face expressions, poses, colors, filters used, body styles etc. To allow us better see the differences between the photos, they are all automatically aligned by eye positions. The project also reminds us that our spontaneous online actions become source of behavioral and cognitive data used for commercial and surveillance purposes - improving results of search engines, customizing recommendations, determining what are the best images to be used in online ads, etc. In the SelfieSaoPaulo, basic data extracted by face analysis software is superimposed on each photo. Images become data, which in its turn is used to structure images presentation. The science used to focus on nature, with smartest people coming to work in physics, chemistry, astronomy and biology. Today, the social has become the new object of science, with hundreds of thousands of computer scientists, researchers and companies mining and mapping the data about our behaviors. In this way, the humans have become the new "nature" for the sciences. The implications of this monumental shift are only beginning to unfold. Will we become the atoms in the "social physics," first dreamed by the founder of sociology Auguste Comte in the middle of 19th century? SelfieSaoPaulo of course can't answer this - but by contrasting expressive and unique faces of the selfie subjects and the numbers software reduces them to, it makes the question itself visible. SelfieSaoPaulo will run every evening for the duration of the festival: June 9 to July 7, 2014. The media facade is located at the building FIESP / SESI and Alameda das Flores (Avenida Paulista 1313). The work was commissioned by Tanya Toft (Ph.D. Fellow at Institute of Arts and Cultural Studies, Copenhagen University and Visiting Scholar, GSAPP, Columbia University). 2014 media facade program is curated by Toft and Marília Pasculli.